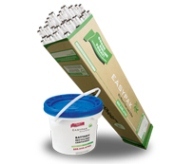 EasyPak Pre-Paid Recycling Containers are the safe and easy way to recycle your facilities’ fluorescent bulbs, batteries, ballasts, and electronics. One price includes everything you need: the UN Certified recycling container, shipping to the recycling center, recycling fees, and certificates of recycling. In order to begin using the containers, go to Air Cycle’s website and follow three easy steps. First, you can select the type of contains you’ll need, such as lamp, battery, and electronics recycling containers. You will then receive your selected containers in the mail and can begin filling them with waste. Return the filled containers for recycling when ready. It’s that simple.